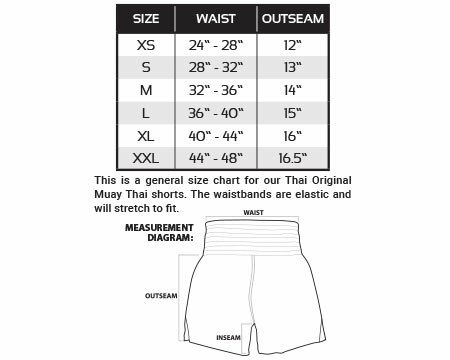 TheseMade in Thailand, Revgear Thai Original Muay Thai Shorts are the high quality, traditional Thai short you've been waiting for! The classic wide elastic shirred waistband in contrast black and red colors stands out and provides a great fit. Made of 100% lightweight polyester satin and featuring a wide leg opening, these offer unmatched comfort and mobility. Get these in red, blue, white or black and match them up with more authentic Thai gear from the Thai Original line from Revgear.